You don’t have to be a newlywed to fall in love with this romantic honeymoon retreat in New Zealand. 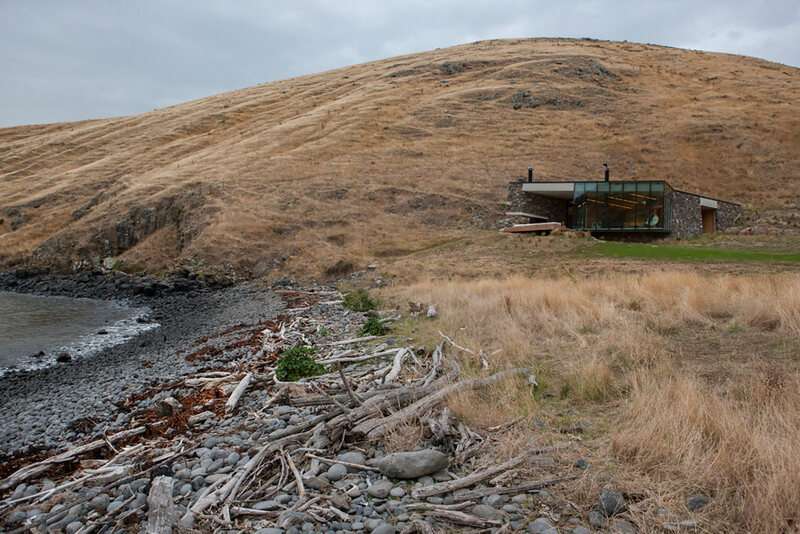 Auckland-based architecture firm Patterson Associates completed the Seaside Retreat, a luxury beachside cabin that seamlessly blends into a South Pacific cove. Built entirely from local materials, the tiny turf-roofed getaway is 100% self-sufficient in respect to water usage and wastewater treatment. The Seaside Retreat may be small, but the remote cabin commands magnificent views of the Bay and the distant Rocky Spires. The eco-shelter comprises three rooms: a lobby, a living/sleeping area, and a bathroom. A sunken spa bath is located on the outdoor patio. The interior is lined with horizontal macrocarpa wood with integrated joinery. Full-height double-glazed low-e glass frame views of the landscape and is secured with storm- and shatter-proof steel mullions with earthquake-resistant sliding heads. Set into the escarpment to protect occupants from falling debris, the beautiful cabin was completed as part of an extensive reforestation and re-vegetation sub-project. Locally quarried rock was used to construct much of the turf-roofed structure and is reinforced by in-situ poured concrete. The Seaside Retreat is one of four luxury villas located on the Banks Peninsula just south of Christchurch. Full-height double-glazed low-e glass frame views of the landscape and is secured with storm- and shatter-proof steel mullions with earthquake-resistant sliding heads. The Seaside Retreat may be small, but the remote cabin commands magnificent views of the Bay and the distant Rocky Spires. The eco-shelter comprises three rooms: a lobby, a living/sleeping area, and a bathroom. 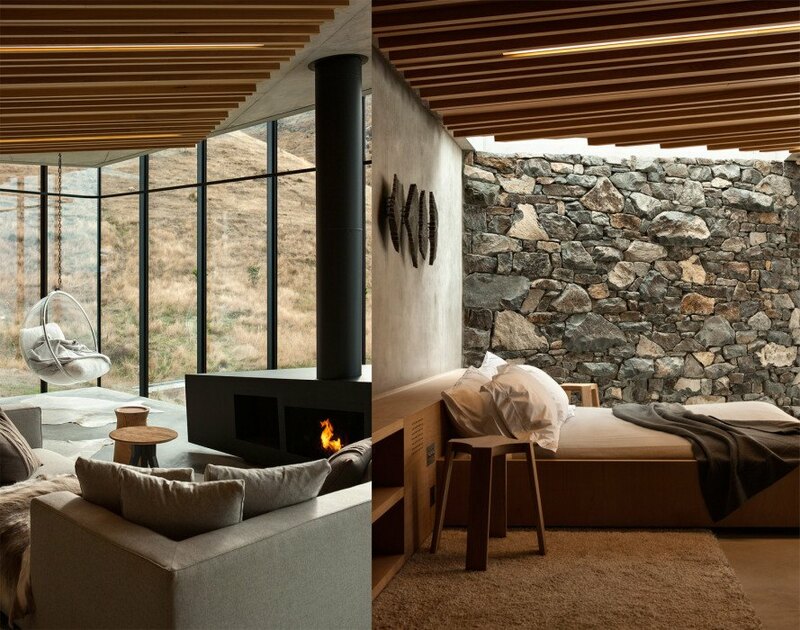 Set into the escarpment to protect occupants from falling debris, the beautiful cabin was completed as part of an extensive reforestation and re-vegetation sub-project. Locally quarried rock was used to construct much of the turf-roofed structure and is reinforced by in-situ poured concrete.